Background: HER2 positive Breast Cancers (BC) have aggressive behavior and poor prognosis. Previously, we have identified miR-342-5p as an upstream regulator of HER2 signaling, as well as inhibitor of HER2 positive BC cell line growth. Objective: Here, we aimed to further investigate the molecular mechanisms behind miR-342-5pinduced HER2 pathway deregulation. Method: Two HER2 amplified breast cancer cell lines were transiently transfected with miR-342-5p mimic or negative control, and gene expression was analyzed by Agilent microarrays. Three clinical datasets with BC patients were used to identify correlations between candidate genes and miR-342- 5p, and associations with survival. Results: Pathway analyses of all deregulated genes revealed a significant suppression of the HER2 downstream pathways ERK/MAPK and SAPK/JNK, whereas the miR-342-5p predicted target genes were enriched for pathways associated with cell motility.Biological functions linked to mitochondrial stability were ranked among the top toxicological functions in both gene lists. 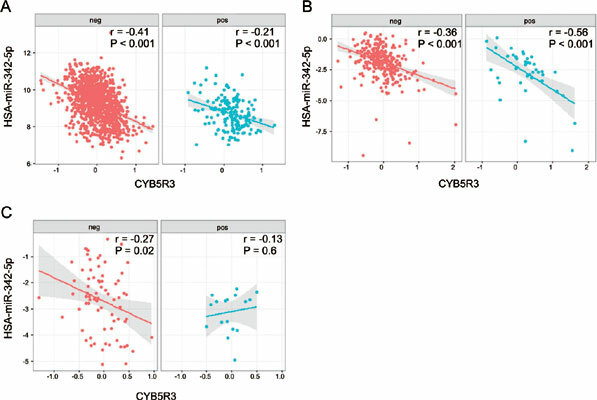 Among the most deregulated genes, Cytochrome B5 Reductase 3 (CYB5R3) and Rap Guanine Nucleotide Exchange Factor 6 (RAPGEF6) significantly anticorrelated and correlated, respectively, with miR-342-5p in all three clinical BC datasets. Low CYB5R3 levels and high RAPGEF6 levels were significantly associated with survival, although this was not directly associated with HER2 expression. Conclusion: Our data suggest that miR-342-5p overexpression in HER2 positive BC cell lines elicits broad effects on HER2 downstream signaling, cell motility and mitochondrial stability. Together these effects may render cells less proliferative and more sensitive to cellular stress. Keywords: CYB5R3, HER2 signaling, miR-342-5p, RAPGEF6, non-coding, MAPK. Keywords:CYB5R3, HER2 signaling, miR-342-5p, RAPGEF6, non-coding, MAPK. Abstract:Background: HER2 positive Breast Cancers (BC) have aggressive behavior and poor prognosis. Previously, we have identified miR-342-5p as an upstream regulator of HER2 signaling, as well as inhibitor of HER2 positive BC cell line growth.